Any assistance needed with troubleshooting the app is supported by Aquto. They can be contacted through the Kickbit app or directly at support@kickbit.com. 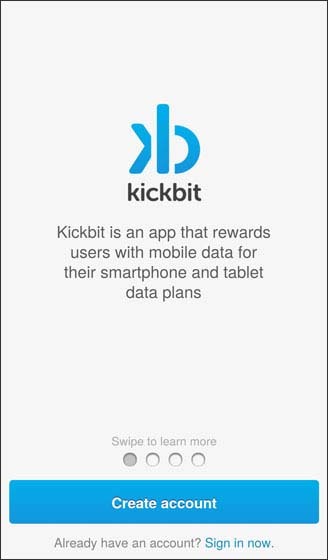 The Kickbit app is not a pre-installed app. For assistance downloading and installing, refer to Download and Install - Kickbit. While visual variations between iOS and Android versions exist the core functionality of the Kickbit app is detailed below. Downloading the Kickbit app may incur data charges. The app itself is free. Enter a Prepay mobile number and click Check data plan. You can also check to see if your data plan is supported online at Kickbit.com. 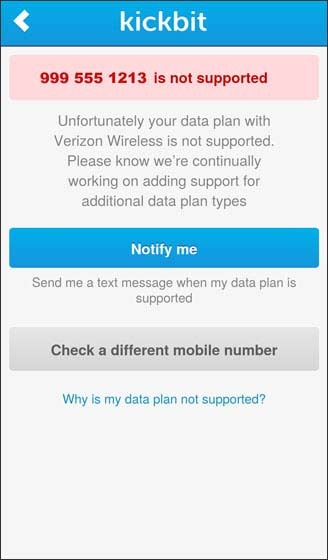 You see the following screen if your data plan is not supported. To be notified when the number entered is supported select Notify me, then click Ok.
After entering a supported number click Continue. To continue, click Accept & Continue. Enter your Facebook Single Sign-On credentials then click Log In. Account creation will grant data reward click Awesome to begin using Kickbit. Click Ok to Sign in with your Google credentials. Account creation grants data reward click Awesome to begin using Kickbit. Enter your full name, email address and Kickbit password then click Finish. To access your existing Kickbit account enter the appropriate credentials and click Sign in. To reset your password enter your email address and click Continue.